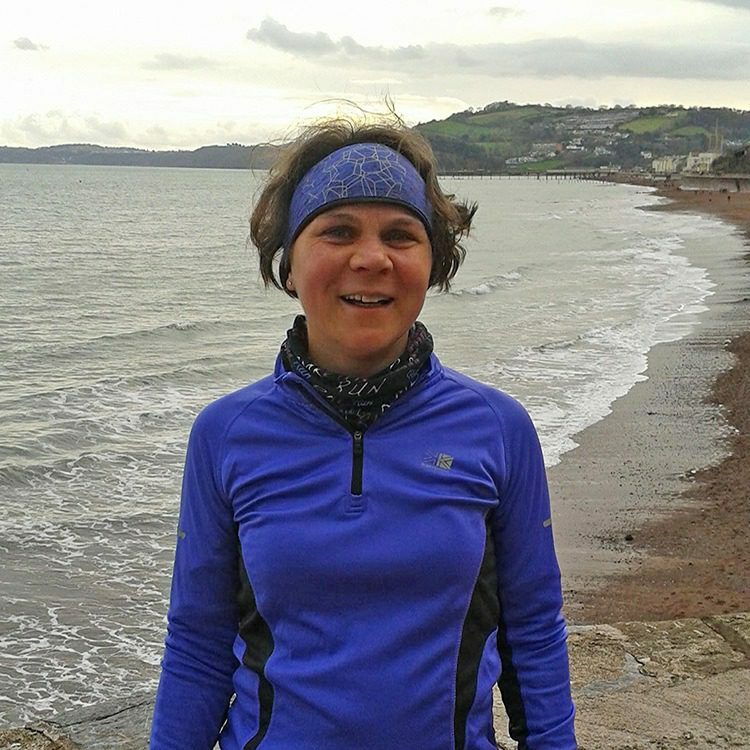 “I rediscovered running by chance two years ago when I took part in the Teignmouth Rabbit Run with my eldest son, not so much of a ‘fun run’ in the hail! This small event still reignited something inside me; I could just go for a run to switch off for a bit and get some much-needed headspace. I can’t praise running enough for the mental boost and its positive impact on my wellbeing ever since. I’ve got well and truly bitten by the running bug, doing a race every month to stay focused throughout the seasons – the bling keeps me going! I have recently completed the Exeter half marathon and I have also enjoyed some hilly and muddy trail races this winter including a night run in Haldon forest. I am 42 this year and running a marathon is my way to celebrate – one kilometre per year of life! It is also the same age my friend Liz was when she sadly passed away at Rowcroft Hospice, hence my decision to run it in her memory and in aid of this charity. It is motivating to know that every mile I run will help make a difference for Rowcroft and the invaluable services they provide in our local community. I am so grateful for the kind donations so far but also for the ongoing support received with fundraising in Coombeshead Academy where I teach (cake sales at parents’ evenings) and in Teignmouth where I live (bucket collection at a karaoke night in town and bag packing in Morrisons supermarket). I would like to thank the Rowcroft team too for their encouragements and practical advice, much appreciated as a novice fundraiser. I didn’t get in the London marathon ballot so I signed up for Paris instead – Liz was a true ‘Francophile’ so no doubt she would have approved of this choice of city. Her courage in the face of terminal cancer will remain with me forever and shall spur me on when the training gets tough, physically and mentally. For now, I am diligently sticking to a ‘First time finisher 16-week marathon schedule’ that suits my weekly running routine and hopefully shall guide me well all the way to the finish line in Paris. Fitting the longer runs around family plans at the weekend has proved to be the trickiest but where there is a will there is a way. To help Sophie reach her fundraising target, and support thousands of families across South Devon living with life-limiting illnesses, make a donation to Rowcroft Hospice today via Sophie’s Just Giving page.